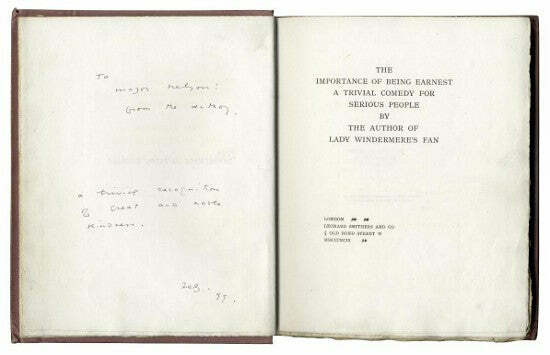 A presentation copy of Oscar Wilde's The Importance of Being Earnest that the author gave to the governor of Reading Gaol will appear at Bonhams London on June 18. The book is inscribed to Major Nelson, who was the governor of the prison when Wilde was sentenced to two years hard labour there for "gross indecency" in 1895, the result of his homosexual love affairs. The Importance of Being Earnest had opened at theatres some months before, but closed after 56 performances when Wilde was convicted. It was not published again until 1899, the year before Wilde's death, and was not seen in London's West End until 1902. "To Major Nelson: from the author. A trivial recognition of a great and noble kindness. Feb, 99." Having been transferred from Wandsworth prison to Reading, Oscar Wilde's mental and physical health began to deteriorate drastically under the draconian rule of then governor Henry Isaacson. Isaacson was replaced with Major James Nelson the following year, who gave Wilde access to books. "The Home Office has allowed you some books. Perhaps you would like to read this one. I have just been reading it myself," he is reported to have said to his most famous prisoner. Nelson also allowed Wilde to begin writing, although all work had to be passed to the guards each evening. It was during this time that Wilde produced his final major work, De Profundis. The manuscript of De Profundis was gifted to Nelson on Wilde's release in 1897. "This inscribed edition of The Importance of Being Earnest is a poignant reminder of the very real hardship which Wilde suffered in prison and the enormous difference which Major Nelson's acts of common humanity made to the writer's morale and health," commented Bonhams Matthew Haley, head of books. "It is arguable that the Governor saved Wilde's life and almost certain that without him there would have been no De Profundis." There were only 100 special copies of The Importance of Being Earnest printed, with this number 13. Wilde also sent Nelson a copy of his later work The Ballad of Reading Gaol, which he wrote shortly after his release while exiled in France. Concealing his identity in fear of repercussions, Wilde attributed the book to "C.3.3" - the block, landing and cell that he lived in while imprisoned. Paul Fraser Collectibles has a superb range of literary collectibles for sale.